There’s a time to accumulate and a time to sort out, both inside and outside. 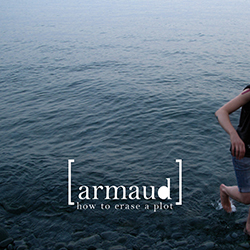 armaud put her life into order by writing her songs: all the tracks from ‘How to erase a plot‘ were inspired by moments she really faced. As already mentioned in the title, her writing has been a cleansing process allowing her to clean parts of her own plot. To erase a story means to make room for a fresh new start while becoming aware of the mistakes already done. Not really faults, rather than bad habits each one of us can change with just a little effort. When listening to armaud her intimate touch stands out immediately so that it’s hard to imagine the right birth-moment of the songs: a room, a guitar and a strong dose of melancholy. A delicate, lo-fi & dreampop (as well as sad pop and trip hop too) record full of bittersweet melodies tasting of an early Cat Power or a soothing PJ Harvey and where the refined arrangements remind us of Daughter atmospheres. Ten enchanted songs that leave us with the chance of being surrended by thoughts and memories, floating in a suspended time.